NAS – Network Attached Storage – Data Storage Device accessible through the network, usually the local area network LAN. Relatively easy to install and maintain. Replacing failing internal HDDs is relatively simple. Value for money investment backup solution as a one-off expense. Multiple simultaneous accessibility allowing for concurrent backup processes. Usually for onsite remote backup solutions, can also be used for offsite storage at different location through the Internet. Very high capacity options allowing for not only backing up but also for sharing (multimedia, docs, etc.). 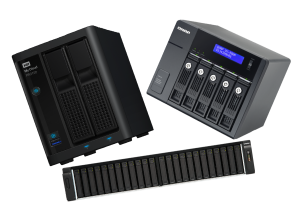 Because NAS are dedicated data storage appliances, they are less prone to software corruptions as extra software cannot usually be installed. Multi-disc units usually configured for self backup and redundancy, providing another layer of safety. The actual storage media in NAS are hard disk drives which can suffer some of the inherent problems of external hard disk solutions – HDD do die in a random fashion! Total responsibility comes with total ownership and control (physical care, virus protection, power spikes, theft, etc.). Single drive NASes although cheaper and better than none are less than ideal as they do not provide redundancy. The operating system running the NAS can be a serious problem (proprietary file format/system) if the control unit fails and the data needs to be retrieved and transfered to another storage facility. Access is through the local area network (or the Internet if offsite) that must be fully functional. Cloud Storage – off-site, normally rented commercial storage space. Setting up access to a NAS appliance located off-site at easily accessible premises (home for small businesses, friends for home users) can be a non commercial – one-off expenditure cloud storage solution to help manage control and on-going costs. Ever improving Internet speed and quality make this option well worth of consideration nowadays. 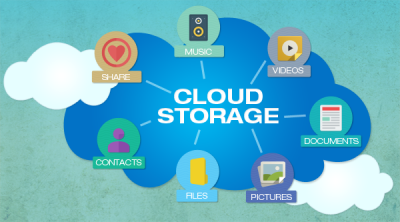 Cloud storage companies sometimes offer free limited space that may be enough for smaller requirements. Offsite access to data from anywhere as long as there is good Internet connection. Service provider is responsible for ensuring data safety and integrity and system maintenance. Storage space is as flexible as buying more or less space. Data access experience depends on Internet connection quality. Not a cheap storage solution in terms of actual storage rental cost as well internet bandwidth penalty. No control on what happens to the data, security and safety entrusted to someone else. Data access dependent of provider quality of service (online, stable, sufficient bandwith, etc.). Recurring expenses as storage space is rented at commercial rates. Suitable for system image storage but would be very inefficient due to cost. Susceptible to virus activities at or through the source, accidental deletion, corruption-overwritting, etc. Service providers survival or life expectancy always conditional on ever evolving technologies and business concepts.